Here’s another wonderful “mommy” meal that I made this past week. It’s also a great “meatless Monday” meal. I saw this recipe a few weeks back on Sprouted Kitchen and I have been dying to make it for some time. I loved my chickpeas burgers so much that I wanted to try another meatless dish that is usually made with meat. When you hear the word meatball you think of meat, right? Well, these are lentil meatballs so there is no meat in them. Maybe lentil balls would be a more fitting name for these. It just sounds weird, so I think I will keep the name meatballs. I loved these lentil meatballs and I wasn’t even missing the meat. They were flavorful and dense like meatballs and they really satisfied my craving for a meatless meatball. Combine them with the lemon pesto and you have yourself a wonderful & healthy vegetarian lunch or dinner. I promise you, you will not miss the meatballs here. This dish was not to popular with my kids, but I wasn’t expecting it to be either. I was really just creating this recipe for myself. My kids liked the pesto, but did not care to much for the meatballs. I ate the meatballs and fed them some quinoa pasta with the pesto sauce. I believe in cooking one meal for the family so I accomplished my goal here. Here are the ingredients you will need to make the meatballs. You will need 1 cup of dry lentils to equal 2 cooked cups of lentils here. Once you measure out your lentils give them a rinse. Cook up your lentils according the directions on the package. 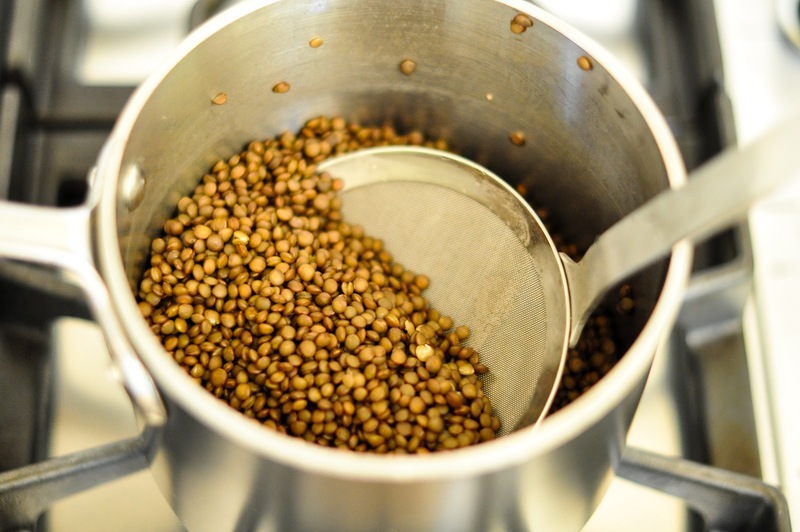 When your lentils are finished cooking, drain them and set them aside to cool a bit. 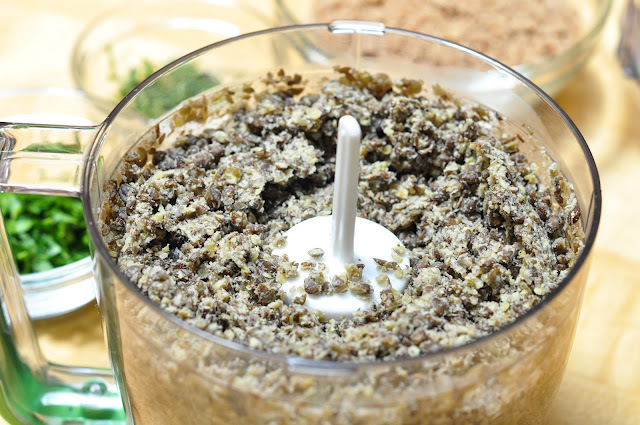 Once your lentils have cooled down for a bit, measure out 2 cups and put them in a food processor. 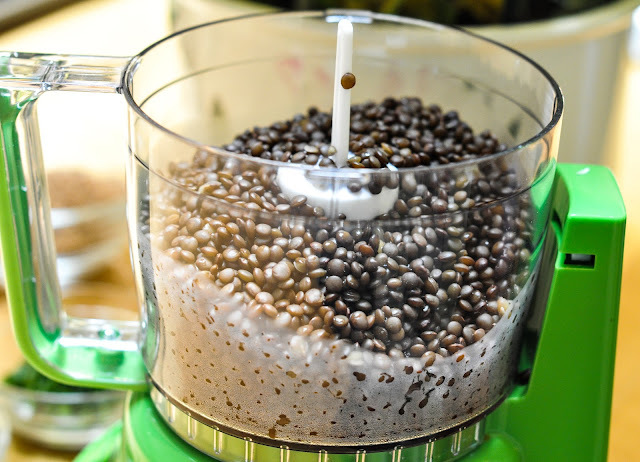 Pulverize the lentils into mush and then put them in a large mixing bowl. Add the beaten eggs, ricotta, parmesan, garlic, fennel seed, parsley, thyme, salt and pepper and stir to mix well. Stir in the breadcrumbs and let the mix sit for 20 minutes. 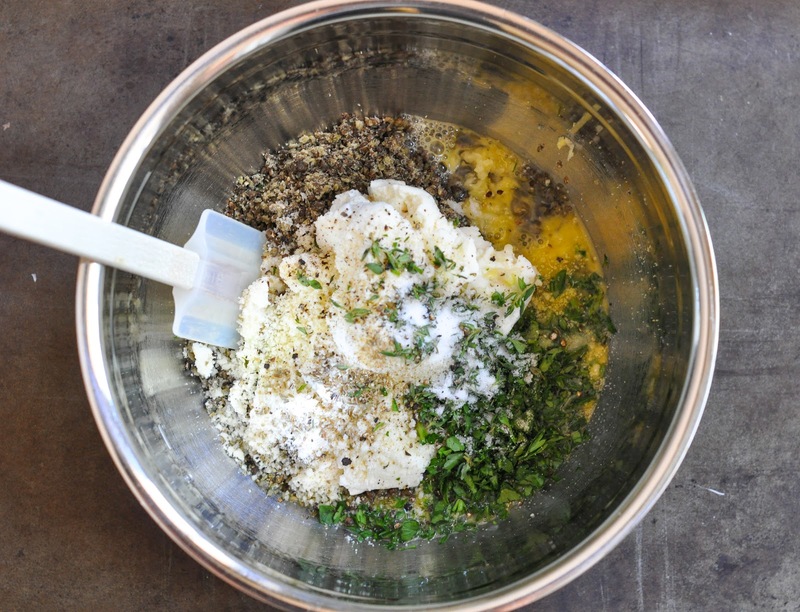 While the lentil mix is resting, pre-heat your oven to 400 degrees and proceed to make up your lemon pesto (see recipe below). After 20 minutes or so, check the lentil mix by rolling a round ball between your palms, it should hold together fairly well. 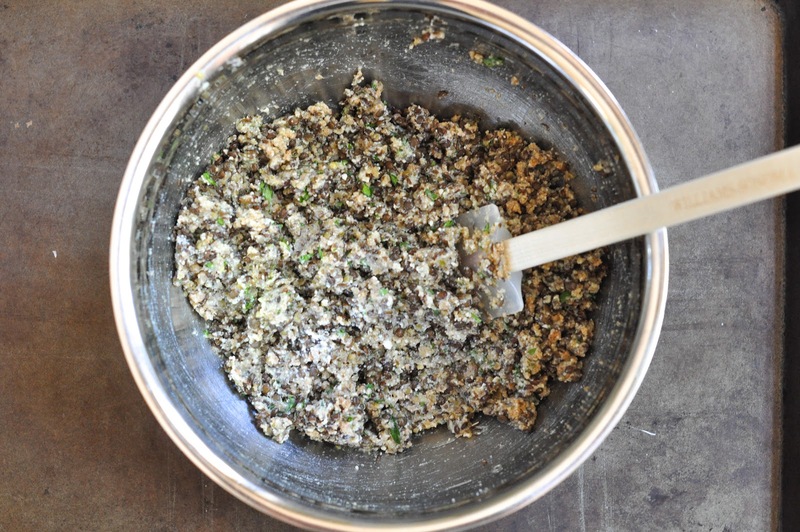 If it seems pretty wet and it’s falling apart, stir in another tablespoon or two of breadcrumbs until the ball stays together. My mix was perfect the way it was. I think using the Panko breadcrumbs made a difference as they are hearty breadcrumbs. Line a baking sheet with parchment paper. Roll the mix into “meatballs sized” balls and line them up on a baking sheet. Note: they don’t need lots of space between them as they won’t spread. If you want them to be crusty, then brush the meatballs with olive oil. I wanted them to be brown and crusty so I brushed the entire meatball with olive oil. Here is a photo of the meatballs after they have been brushed in olive oil. See how nice and shiny they are! Bake on the middle rack for 15-20 minutes until the tops are golden brown. Make sure you turn the meatballs halfway through the baking time. Remove and cool slightly. 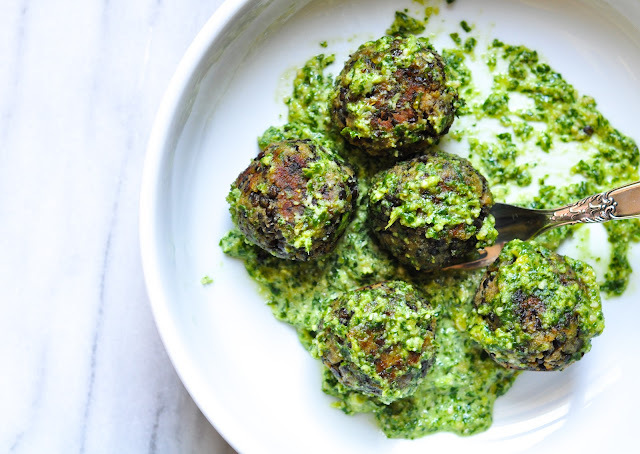 These lentil meatballs are wonderful on their own with the below lemon pesto or you can pair them up with your favorite pasta, like quinoa to make a healthy and vegeterian spaghetti and meatballs. Note: Lentil meatballs can be a bit on the dryer side so you will want to moisten them up with this pesto. Prep all of your ingredients. Wash and dry your basil leaves, zest and juice your lemon, peel your garlic, measure out your pine nuts and parmesan cheese. Put the garlic, pine nuts, lemon zest, lemon juice and salt in a food processor or blender and run until smooth. Add in the basil leaves and olive oil until you get a smooth, sauce-like consistency. 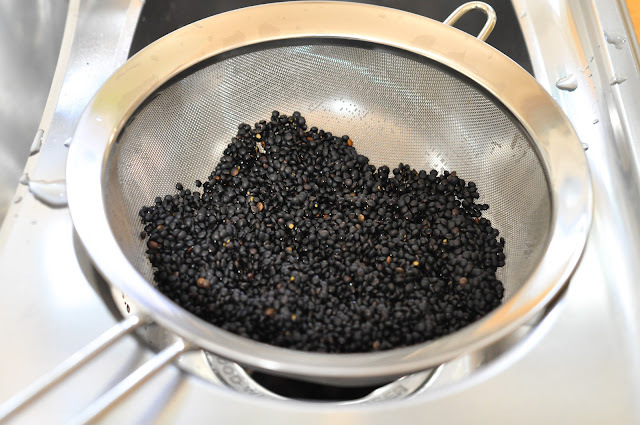 Add 2 tablespoons of water to thin as desired. I used 2 tablespoons, as I like my pesto be a bit thinner. This is optional of course. Stir in the parmesan and set aside. The sauce will keep covered in the fridge for about a week. Note: Sometimes my pesto comes out green as shown in the picture above, and sometimes it comes out a bit more yellow-green. It really depends on how big the meyer lemons are. Don’t fret on the color, as it tastes amazing no matter what the color is. If you feel you want more green, then just add some more basil to taste and then process again. My favorite way to enjoy these is topped with lots of the pesto and thrown on some quinoa spaghetti. Have you ever tried a meatless meatball? Looks amazing! I find that grated onion adds a lot of moisture to my turkey meatballs; I bet it would do the same thing here. I would process half an onion before adding the lentils to the food processor…I’m giving this a try! Also, I have green lentils on hand. Do you think those would work as well? Looks and sounds delicious! I use lentils in various ways and have a few varieties of pesto that I love to make, but these are both new and exciting ideas. Thank you so much!!! 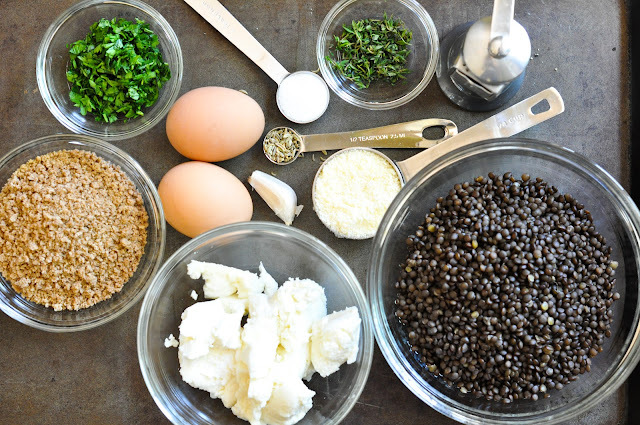 i am pinning this one to soon make for meatfree monday…i love lentils. 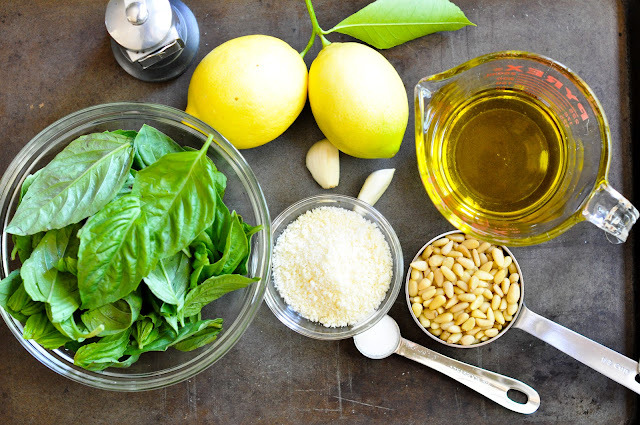 love lemon and love pesto…super excited to try this!!!!! Hi Sharon! Thanks for stopping by and saying hi. It’s funny, but my most popular recipes are my healthiest! I would honesty recommend any one of them. They are all my faves! OMG – I’m so inspired by your blog. Great tutorial, I can’t wait to try this recipe. I’ve been observing from afar albeit in Corte Madera. It is nice to see your success. So we tried this tonight, and it was fun to prepare with my daughter (11 years old). … A winner! I used steamed lentils from Trader Joe’s, so it was a quick and and my husband loved it all too. We bumped up our pesto with had an extra garlic clove and some fresh parsley. Love the lemon. We included a baby greens salad w/ extra baby spinach, avocado and tomatoes with a dressing of rice vinegar, olive oil and Dijon. Hi neighbor! I am so happy you took the time to comment and let me know how the recipe turned out for you. Also, thank you so much for the kind words. It really makes me happy when neighbors and friends in the community actually make the recipes. That is what this blog is all about, sharing the food and sharing the love. I am psyched that your daughter and hubby loved the meal as well. My kids are still turning their noses up at the meatballs, oh well. I am also going to try your idea with the ready to go lentils from Trader Joe’s. What a time saver. I may even include that tip in the recipe for my readers. Thanks again for stopping by and saying hi! Just followed this recipe exactly and everything came out perfect! The pesto is so good its unreal. I has basil, thyme, and parsley all in my garden and i think it really made a difference in this meal. The lentil “meatless” balls were not that dry either! I was surprised considering the ingredients, but they turned out fantastic. Thank you so much for this recipe, my parents who are both meat eaters ( and one who doesn’t like basil) just finished off the rest of this! I’ll post a picture on my tumblr after I eat! Hi Candace. I am so glad that these turned out so well for you and that your meat eating parents loved them. I think any meat eater would not miss the meat in these meatballs. Thanks for letting me know how it all turned out. I love hearing how recipes work for people and if they liked them or not. Let me know when you post your picture to Tumblr as I would love to see it! The lemon pesto is also my favorite pesto. Sooo good! Hi, this recipe looks awesome and I can not wait to try it! I am curious, What is quinoa spaghetti? We LOVE quinoa here and love new ways to try it! Hi Mary Kate. The quinoa spaghetti I get is called Quinoa Harvest. Here is a link to their website. You can get this pasta at most grocery stores and definitely at Whole Foods. Whole Foods also has great sales on this pasta from time to time so I stock up when they do! Okay, I am always on the lookout for great vegetarian dinner recipes. Love this one. Thanks! Hi Andrea. I am thinking you could try to substitute the ricotta with an equal quantity of mashed soft or silken tofu blended with a dash of lemon juice. Hi Andrea. You could substitute equal parts nutritional yeast & ground almond meal with a bit of seat salt for the parmesan cheese. SO as much as I don’t think my husband will tolerate this as Sunday lunch, I think he could for it tomorrow dinner. Especially since we have ricotta in the house – FOR ONCE. Unfortunately we dont have any lentils – I could buy some and they’re quick cook BUT we do have lots of kidney beans… do you think they’d work as a sub? Or too strong a flavour….? Hi Em! I’m not sure how they would taste with kidney beans but give it a try and see. This was my first time experimenting with a meatless meatball so I’m not sure about the different substitutions. So I am taking Sunday lunch is your big and fancy meal! I love that! John and I tend to cook together on the weekends and it’s so much fun. I let him take over the kitchen and I am the prep chef and the dishwasher. Yep – Sunday lunch is when I promise to leave all ‘health stuff’ at the door – and we go all out!! We also try to do a long walk… so I actually kind of crave pasta on those days. ANYHOW – we’ve saved the ricotta to make homeamde flax wholewheat pizza this Thursday. I was a bit worried about wasting it if the bean thing went wrong – but Im making pesto to have with the pizza. Wholewheat spinach and ricotta pizza with lemon pesto.. can things get much better…..?? Excited to confirm how it all works out! Hi Em! I can’t wait to see how your pizza turns out. It sounds delicious to me. It’s so funny how my food tastes have changed in the past 10 years. I can’t believe that I’m actually craving flax wholewheat pizza. If the recipe turns out yummy, post it!!! Date night with Eli? Confused? I sometimes feel like I’m loosing it. I just got done with a 3 hour hot lunch session at Eli’s school (we serve the kids hot lunch) and it was raining so they had indoor lunch and it was CRAZY! Messy but fun! Sounds like a plan Averie 🙂 I can’t compete with your desserts!